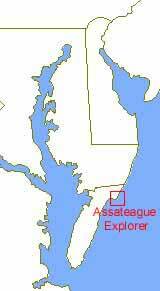 Chincoteague Island is only 20 minutes south of the Md./Va. state line on the Eastern Shore of Virginia. From Rt. 13, take Rt. 175 E to Chincoteague. Or from Rt. 113, take Rt. 12 S then Rt. 175 to Chincoteague. (To Curtis Merritt Harbor for BOAT CRUISE): Turn right on Main Street, head south to very end (approx. 3 miles to reach end of Main Street), look for Curtis Merritt Harbor on left. You will see boat slip #71 as soon as you enter. FREE parking & restroom are available at the harbor. (To Memorial Park for KAYAK TOUR): Turn right on Main Street heading south. Go 1.2 mile then left onto Bunting RD. Drive about 0.5 miles then turn left on East Side Rd. Turn right into Memorial Park. FREE parking, restroom, playground for kids, scenic waterfront picnic area & skate park. OCEAN CITY, MD 51 Mi. approx. 1 hr. FENWICK ISLAND, DE 60 Mi. approx. 1.5 hr. NORFOLK-VA BEACH, VA 85 Mi. approx. 2 hrs. LEWES, DE 87 Mi. approx. 2 hrs. ANNAPOLIS, MD 140 Mi. approx. 2.75 hrs. CAPE MAY, NJ 123 Mi. approx. 3.5 hrs. WILLIAMSBURG, VA 146 Mi. approx. 3 hrs. BALTIMORE, MD 167 Mi. approx. 3 hrs. WASHINGTON, D.C. 171 Mi. approx. 3 hrs. NEWPORT NEWS, VA 190 Mi. approx. 3.5 hrs. PHILADELPHIA, PA 190 Mi. approx. 3.5 hrs. RICHMOND, VA 193 Mi. approx. 3.5 hrs. NEW YORK, NY 275 Mi. approx. 5 hrs. CAPE HATTERAS, NC 232 Mi. approx. 5 hrs.